8 page paper booklet, 5 1/2" x 8 1/2," containing two poems. Green paper cover includes nature scene in the upper left corner. First poem, celebrating Bill Bailey's birthday, written by Edward Affhauser, December 14, 1910. Undated second poem is a response by Bill Bailey. Poems are filled with local references to friends and acquaintances. Gift of Claude Belair Jr, (1932 - ). 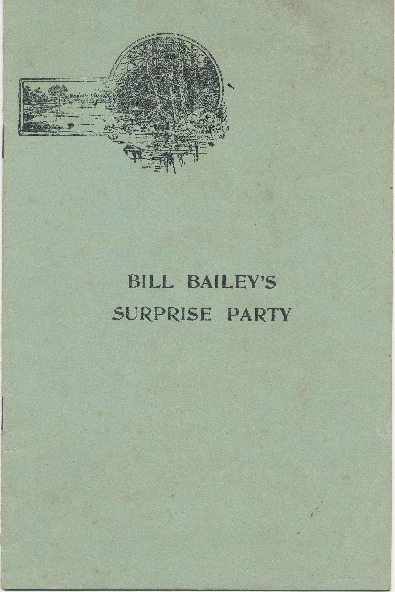 Unknown, “"Bill Bailey's Surprise Party"--Booklet of Verse,” Conway Historical Society, accessed April 21, 2019, http://conwaymasshistory.org/items/show/554.